It is frustrating beyond words to realize at the very last moment that the printer has no ink! If it has happened to you, you will know what we mean. It is even worse when you need a print urgently and discover that your Epson printer has run out of ink. Thankfully for all of us, this irritating problem has a solution! Yes, printing without black ink is indeed possible, and we are here to tell you just how you can do that. The trick is to print in monochrome instead of black ink. How do we do that, you ask? Follow our lead! While the main process is the same, the steps may vary based on the operating system you have. Open the print dialogue box and stop the queue immediately. Find Epson Printer Utility and open it. You will find driver settings in this dialogue box with a checkbox to “Permit temporary black printing”. Check this box. Now, check the Print Settings and in the media setting, choose Plain Papers. Here, choose Grayscale. Just like above, stop the printing queue before you do anything else. 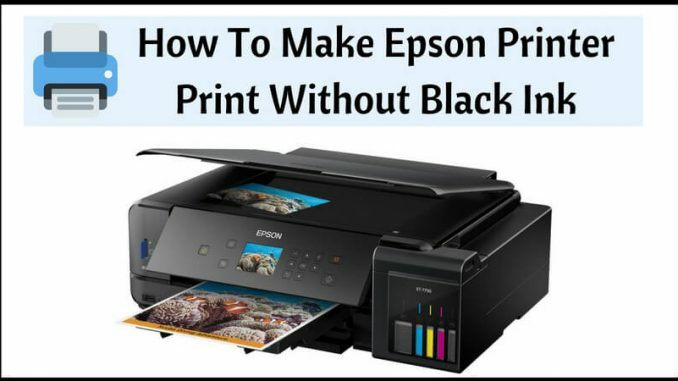 On your computer, navigate to Printers and Devices and choose your Epson Printer that has run out of ink. Now, in the quality option, you will see Type Settings. Change that to Plain Paper. Go to Print and choose Grayscale. That’s all. You can start printing. Sometimes, issues such as the printer running out of ink can be temporarily resolved and these techniques are best left for emergency purposes. It is always wiser to be on the safe side and keep a check on your printer cartridges. Replacing them as and when required can save you a lot of hassle. Go ahead, finish printing. You can thank us later! What did you do when your printer ran out of ink, and you couldn’t go to the store to print? Tell us!